4G Signal Booster for Machine to Machine (M2M) Applications. Great for Vending Machines, ATMs, Remote Stations. Connect Directly To Your Cellular Modem or Router. Comes with AC Wall Outlet Power Supply. Pro Signal 4G direct connect 3G & 4G cellular amplifier with AC Wall Power Supply for cellular modem signal improvement. Great for Vending Machines, ATMs, Home, Office, etc. Part #460119 (formerly 470119). The WilsonPro Pro Signal 4G was developed specifically for Machine-To-Machine (M2M) applications. It is based on the same field-tested, market-proven technology that powers Wilson’s cellular signal boosters for the consumer market. The Signal 4G is ready to integrate with cellular modems, Hotspots, MiFi devices & routers to provide reliable signal that ensures successful data transfer. This booster kit works with all US wireless service provider networks and boosts 4G Internet using 700MHz AT&T, 700MHz Verizon, 1700/2100MHz T-Mobile, 800Mhz & 1900MHz frequencies. The Pro Signal 4G comes with a 3 foot RG-174 cable with SMA Male connectors on each end. It will connect directly to devices with SMA Female connectors. We also have a variety of external antenna adapters to connect to other external antenna port type. Hotspot & Router Antenna Adapters, USB Modem Adapters, Cable Connector Adapters & Converters. The Pro Signal 4G’s small size makes it an ideal for vending machines, remote monitoring stations, vehicles or other installations with little room. It can be paired with a variety of expertly designed Wilson Electronics cellular antennas for maximum system gain to overcome a weak signal. The Signal 3G is FCC certified to the latest technical standards for cellular signal boosters. No Shipments or Use Outside the U.S. Unfortunately All weBoost and WilsonPro Signal Booster Systems can only be shipped and used within the United States. weBoost or WilsonPro products certified by the U.S. Federal Communications Commission (FCC) are no longer recognized by Industry Canada (IC) to be certified for use in Canada and cannot be used or shipped to Canada. There are specific version of Canadian Approved (IC) than can be used. Please contact a weBoost or WilsonPro dealer in your country for these systems. BEFORE USE, you MUST REGISTER THIS DEVICE with your wireless provider and have your provider’s consent. 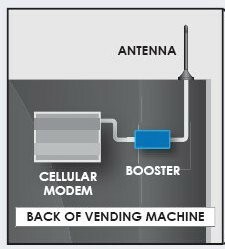 Most wireless providers consent to the use of signal boosters. Some providers may not consent to the utilization of this device on their network. If you are unsure, contact your provider. You MUST operate this device with approved antennas and cables as specified by the manufacturer. Antennas MUST be installed at least 20 cm (8 inches) from any person. You MUST cease operating this device immediately if requested by the FCC or a licensed wireless service provider. I have a Verizon Jetpack and the signal in my house was weak. Only 1 bar. Purchased this kit. Wow! Consistently 3 to 4 bars and no dropped signal! I am very pleased with this product! I use this booster to boost the signal for the Novatel T1114 Tasman Verizon Wireless 4G LTE Broadband Router. Works great!